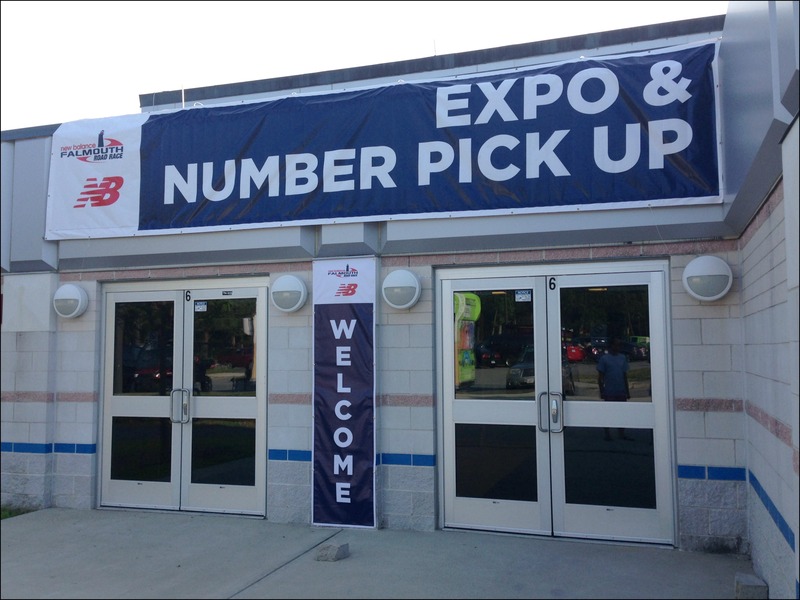 Last night Jason and I headed over to the Falmouth High School Field House to pick up my race bib and check out the Falmouth Road Race Expo. We decided to go on Thursday night hoping it would be the least crowded (before all the “out-of-towners” came in for the race!) 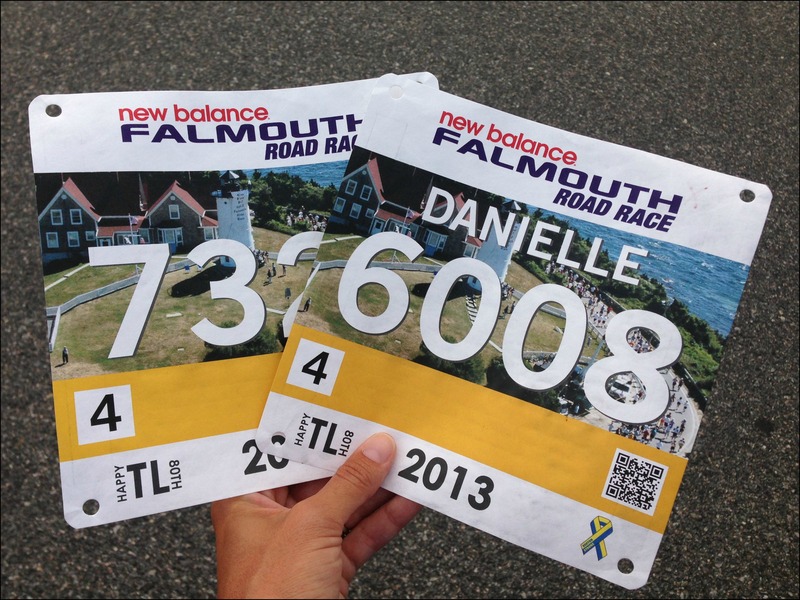 and since Falmouth is the next town over from where we are on the Cape (literally!) it was an easy trip! Bib pick up was a breeze and I was even able to pick up my friend Pat’s bib for him by just showing a picture of his license that he had e-mailed to me. In the expo I grabbed our “goody bags” and walked around for a bit checking out the vendors. It was definitely a smaller expo and there were a lot of empty booths (I’m assuming not all vendors arrive in time for the Thursday night opening of the expo). 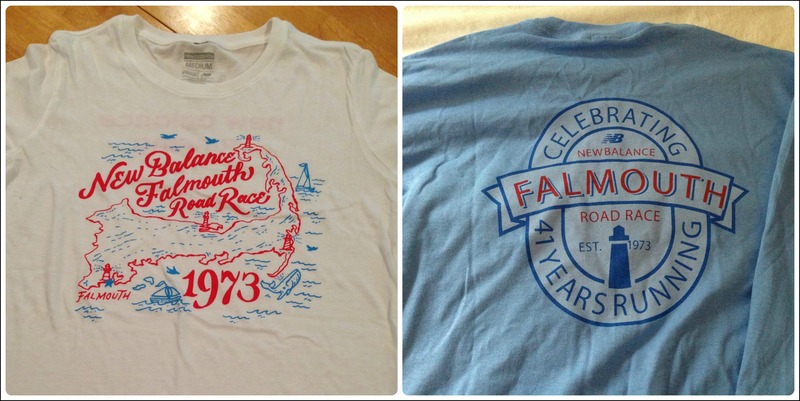 Jason and I each picked up a Falmouth Road Race shirt and I grabbed a new running visor and we were on our way (we had dinner reservations at our favorite Falmouth restaurant!). My shirt on the left and Jason’s on the right! When we got home after dinner I immediately dissected my race bag to see what was inside! First of all, how cool are these bags?? Great material and totally re-useable! I heard a lot of people commenting on how much they liked them! ** please excuse the crappy pictures, not much space for pictures up here and it’s raining outside! 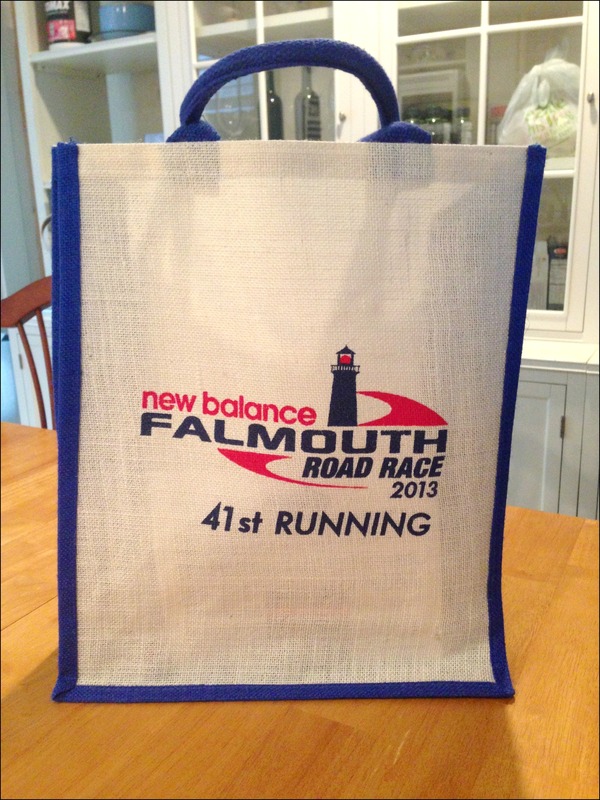 The bag had all your usual sponsor pamphlets and flyers, plus a race program, poster and COFFEE MUG! 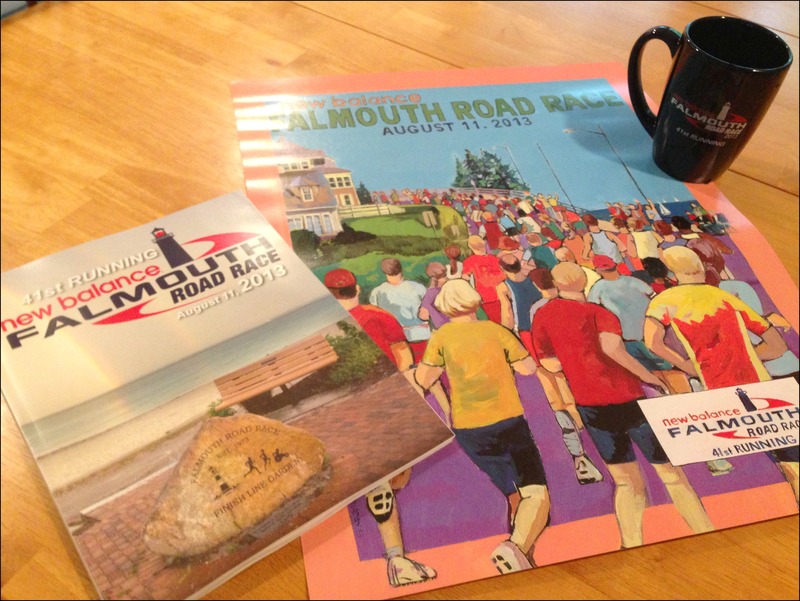 Unlike most races you don’t get a (wrong sized / badly fitting/ ugly) t-shirt with race registration, you get a coffee mug! The race program is a great souvenir too and has a lot of really interesting information on the race history and stories from past runners. Overall a small but well organized expo with very helpful and friendly volunteers, and MAJOR points in my book for the coffee mug (which I’ve decided I can’t drink out of until after the race!). P.S. – if you’d like to track me on Sunday you can sign up HERE! Yay – have fun! And a coffee mug is a great idea. I’m with you – I have a lot of race shirts that I never wear (including my Disney ones – sniff, sniff), because they just don’t fit right. 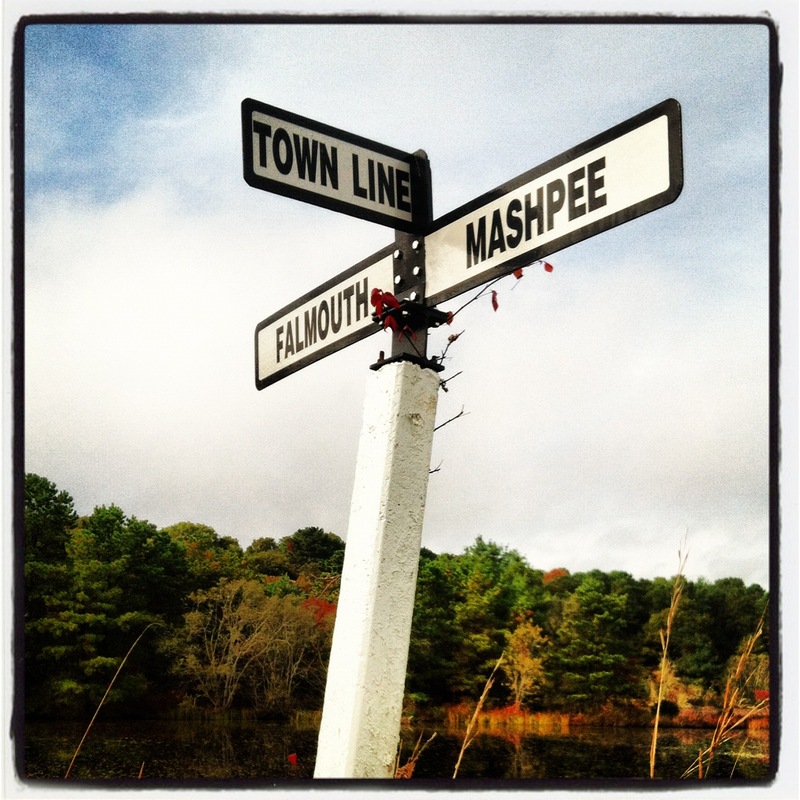 Random question – do you guys own a place on the Cape, or do you rent? Good luck with the race. Love the tee shirts and the coffee mug. Very nice race swag! I’m a sucker for a well designed race shirt and I love the ones yall picked up! I’d totally trade in a couple of mine for that awesome bag and mug. Smaller races it seems like anything goes with the expo, especially the shirts (not always flattering or designed well). And then sometimes I get a bag with stuff other times its just the shirt and program! The mug is definitely cool even without the shirt!!! These were some of the best race bags I’ve gotten so far! I loved the mug, poster & program and the bag itself! LOVE the idea of a coffee mug or something other than a t-shirt. I have SO many shirts. But those shirts you got are super cute! Thanks! I feel like this is one of the only race shirts I’ll wear! I’d love more race mugs or even a hat!